DERMagic Pepperming & Tea Tree Oil Shampoo is a sulphate free, pH balanced shampoo which prepares inflamed skin for treatment. It’s perfect for any day bathing as well. Combining the essential oils of melaleuca (tea tree oil), peppermint, lavender, chamomile and rose hip seed extracts, DERMagic Shampoo is gently restorative and promotes healing. In place of sulphates Aloe vera, vegetable glycerine, oat extract and wheat proteins make a foaming shampoo with a beautiful fresh scent. Use with DERMagic Peppermint and Tea Tree Oil Conditioner for best results. 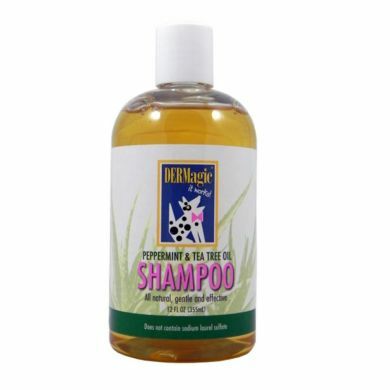 For healthy dogs - Bathe minimally. No more than twice a month or even less is ideal. For dogs with skin problems see instructions for the Guaranteed 4 Step Process below. Aloe barbadensis (aloe) juice, lavendula angustifolia (lavender) extract, anthemis nobilis (Roman chamomile) extract, sodium coco-polyglucoside tartrate, sodium coco-polyglucoside citrate, cocamidopropyl betaine, kosher vegetable glycerin, diazolidiny urea, tocopherol (vitamin E acetate), calcium d-pantothenate (pro-vitamin B5), mentha piperita (peppermint) essential oil, melaleuca alternifolia (tea tree) essential oil, hydrolyzed wheat proteins, avena sativa (oat) extract, simmondsia chinensis (jojoba) oil, rosa mosqueta (rosehip) seed oil, salix nigra (black willowbark) extract, tetrasodium EDTA, xanthan gum (polysaccharide gum), citric acid. Note: This product contains no preservatives. Store in a cool place and refrigerate after opening. DERMagic products can be used individually to excellent effect. 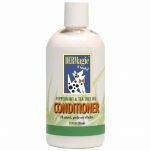 But for severe cases of dryness & itchiness DERMagic recommends this 4 step process get relief for your pet (and you). Check out the video on the left of the page for a thorough explanation of the process. Before starting any treatment, cleanse your mate with DERMagic sulfate-free shampoo and gentle conditioner system. 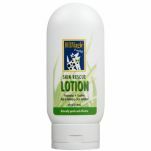 Massage this soothing lotion well into the affected areas twice daily. Use it as you'd use hand lotion on yourself: not too much, not too little, and the skin should not appear greasy or wet. The Rescue lotion penetrates deeply into follicles where mites, fungus and bacteria reside and eliminates them all. In a few weeks you’ll begin to see a fuzzy undercoat of fur growing, followed by longer outer coat hair. Any black skin will flake away with soft pink skin appearing underneath. This process is a deep exfoliation where dead outer layers of skin make way for new skin. Any fungus has to be killed so that the skin can start to repair itself and rebuild its immunity. With black skin disease this takes some time. Keep applying this lotion as long as there is still hair loss and flaking skin (or darkened skin). The new skin grows underneath and will slough off the old damaged skin. When you see new pink skin appearing switch to the Hot Spot Salve to treat any stubborn or difficult-to-heal sores or spots. These are the stubborn areas where the dead skin hasn't sloughed off yet, and the pink skin hasn't appeared. Be patient and persistent. This system will work! 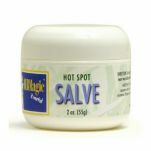 For hot spots, minor wounds, insect bites, localized allergic reactions and itchy or inflamed areas, dab on a small amount of DERMagic Salve topically once or twice per day until symptoms disappear. Keep DERMagic handy for those small bites or cuts to prevent infection. 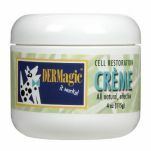 As the skin heals and fur starts to come back, massage in DERMagic Cell Restoration Crème as needed to soften and protect new skin. This will speed up cell regeneration, boost immunity and prevent reinfection. Your dog’s skin will stay healthy and moisturised. + especially good for cracked pads or chapped noses in winter and scorched feet in summer. Read 2 customer reviews of DERMagic Peppermint & Tea Tree Oil Shampoo. The average customer rating is 5. What a miracle product is DerMagic 2 shampoos, 1 conditioner, day 2 of lotion and the horrific black skin on my Spitz is pale grey. Have been using Malaseb for months. Excellent product. Makes such a difference to our beautiful dogs atopic allergies. Nice smelling too. Well worth following instructions and washing twice.